The eRAILS2 system is a component of the project for the Promotion of Science and Technology for Agricultural Development in Africa (PSTAD). 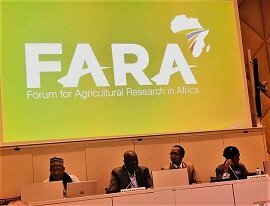 PSTAD is a project initiated and coordinated by FARA, managed by the Sub-regional Organizations (SROs) and implemented by the National Agricultural Research Systems (NARS) in 34 countries in Sub-Saharan Africa. The project is funded by the African Development Bank (AfDB) which provides financial support to two of FARA’s regional initiatives based on the demands of its stakeholders. These are: the Regional Agricultural Information and Learning Systems (RAILS), and the Dissemination of New Agricultural Technologies in Africa (DONATA) projects. – Give farmers a voice – Establish a constructive dialogue in a bottom-up approach between the farming community, the national agricultural research system and the other stakeholders of the agricultural sector in a bottom-up approach. – Enhance the knowledge management capacity of the RAILS Learning Teams (RAILS-LTs). Especially the project seeks to increase their capacity to mediate between the farming communities and the national agricultural research system. – Improve sharing of information between the countries in the region. – Make relevant and high quality information from research available and accessible to the farming communities. – Make up-to-date data and information from the rural areas available to the research community. – Contribute to the completion and up-dating of the regional database on experts, institutions, programmes and projects. – Identify limiting factors in production that should be addressed by research and development. – Highlight investment opportunities at various levels of the agricultural sector. – Contribute to the development of a strong African Agricultural Information Systems Platform. – Develop of an operational framework for sustainable up-scaling of the concept.